Here we go!! My monthly reflection of everything I did, how much I got paid and my successes and struggles as a fairly newish blogger. For those who are new to my income reports, welcome! I’ve been blogging for a year and a half and I am now starting to see results! This month focuses preparing for my book launch (! ), new ways to research my audience and investing in my business. Can I just scream with joy that I’m launching my first product!! Not only will it be an additional way revenue source, but it is also so new and exciting. The book is called Christmas with Kids: Recipes, Activities and Crafts for Amazing Family Memories. My idea for the project started exactly a year ago when I coordinated a blogger collaboration for the Christmas season. Called “Countdown 2 Xmas,” this project involved over 75 bloggers who each created a recipe, activity or craft to celebrate the holiday season. Each blogger chose a day to publish and the other bloggers in the project promoted their work on that day via their own social media channels. From that project, I approached 12 of the bloggers to feature their work in a book to be sold during the 2015 Holiday season. They graciously agreed and I’ve been busy compiling the book since June. I’ve learned Scrivener for book organization. Then exported to MS word as a desktop publisher. Along the way, I’ve learned that I hate MS word for publishing and will be looking into Indesign for my next project. This past month I’ve spent working on my launch plan. Jeff Walker, who I highly recommend if you are planning to launch a product, offered three amazing FREE videos on his product launch method. I watched these as well as used the knowledge I gained from Elite Blog Academy on product launch. Stay tuned for next month’s income report when I divulge my entire launch plan and let you in on the results. You can sign up for my launch HERE. I always want to find ways to better serve my readers. Actually figuring out how to serve them is very hard though! The fall activities post attracted many new readers in the Phoenix area. I spent $60 on a Facebook ad for that post. From that, I received 4,500 paid post engagements – meaning that I received either a like, click or comment that I wouldn’t have otherwise because I paid for an ad. During that time, I also increased my Facebook likes by 150 people and my email list by 25 people. I tied my POGO pass affiliate link to that post and received $30 in commission. I didn’t make my money back from advertising, but I gained a few new readers. I now realize how much I need my own product to tie to my Phoenix activity posts. Look for that in February 2016. I’m one of those odd people who loves public speaking. It’s one of the aspects of teaching that I loved so much. 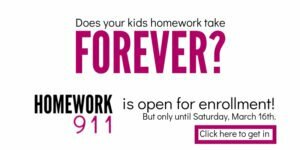 This month, I spoke to elementary school and middle school parents about developing an effective homework routine for their children. While I wasn’t paid, the experience of being able to interact directly with parents and discover exactly what problems they were facing gave me a few new post ideas. I’m looking to expand my public speaking engagements by networking with a few child psychologists to see where I might fit in this speaking arena. If you have ideas, please let me know! My next step is how to grow Whimsicle. I want to have a solid, recognizable brand with a lighter slightly more stylized feel to the site. Starting on November 2, I’m starting my site redesign with an actual graphic designer. Up until now, I’ve been my own graphic designer. I have no graphic design experience but Canva’s free design school has helped me immensely. I have a few concerns with my site as it is now. First, it loads pretty slow. I’ll be moving over to the Genesis platform with this redesign which will hopefully speed it up and also give me access to more ad space – something I do not have in my current theme. Pinterest’s algorithm change has hit me hard. 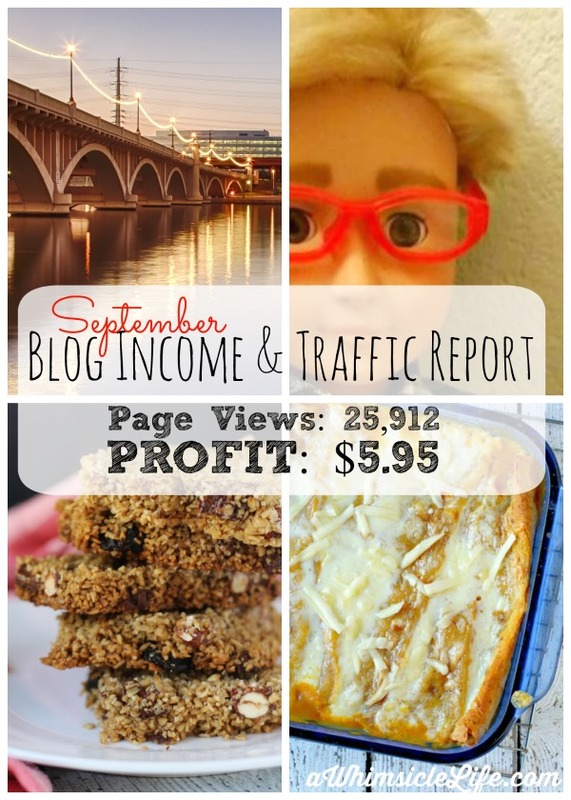 In August, I was receiving close to 350 Pinterest referrals per day. That number has dropped down to 250 in September. I released the Fall Break activities post on September 22 which upped the traffic slightly giving me about the same page views as last month. But there is a profit! That is the important part! As you can see, my expenses were high this month with the deposit on my website redesign as well as buying a shotgun mic from Amazon to improve the audio quality on my videos. Keeping it in the black this month was a huge success for me! How is your blog business? What can I help you with? Thank you Sarah! I’m going to have affiliate links for the book as well if you are interested in being an affiliate!